One of the Power Five's toughest jobs might have chosen the right coach to fix things. Iowa State head football coach Matt Campbell spoke about learning how to win during this spring’s Big 12 media day, and rightfully so. The Cyclones collected just 11 total victories from 2013 through 2016, and never won more than three games in a single season. ISU has never really had a problem losing football games in its history. The program has only finished a season ranked twice, has a high-water mark of 19th in the final rankings, and hasn’t won a conference title since 1912. But all of those losses never really amounted to much beyond… more losses. As a result, searching for the “golden era” of Iowa State football Campbell is trying to aspire to is a tough concept to nail down. Outside of the power conferences, winning cultures can be built from scratch. In leagues like the Big 12, you’re typically chasing previous successes. For Campbell, the closest you’re coming is a stretch from 2000-2002 when ISU went 23-15 but finished in the top 25 after a 9-3 2000 season. That Sage Rosenfels-led squad won four road games and a bowl game, and ended up with a handful of future NFL players. They lost to the teams they were supposed to, but were fun to watch and a surprising story. In some ways, that’s the same goal that Campbell has in mind for this year’s team as they try to build from the ground up. Iowa State had found early wins under former coach Paul Rhoads (three bowl games in his first four years), but cratered afterward. The program’s offense was top-60 just twice in that stretch, and more often was ranked among the 30 or so worst attacks in the country. Going up against a Big 12 largely centered on Air Raid talent from Oklahoma and Texas, that’s not going to win you many games. The Cyclones don’t need Texas Tech’s high-flying scheme, but points are a must in order to compete. Campbell brought the needed experience for a system like that when he arrived last season. The former Toledo head coach had a top-40 offense all four years with the Rockets. That program’s best advantage was being in Ohio, with access to a large talent pool. But the MAC’s limited athletic budgets can be an inhibitor. Iowa State doesn’t have access to the same talent, but does at least have some more money to put behind a program rebuild. That rebuild starts with Campbell’s offense. It’s no up-tempo spread though, and actually focuses in on the offensive line and run game to get things going. As Football Study Hall’s Ian Boyd noted when Campbell was hired, he needs big O-linemen, workhorse running backs and receivers that can work in isolation if they want to score points. So far, it seems to be working out. Iowa State scored more than 41 points per game last year — including efforts taking Baylor, Oklahoma State and Kansas State to the wire — along with hanging 66 points on Texas Tech. Through two games this year, they’re averaging the same total (41.5), but already appear to have taken a step forward in terms of competitiveness. Beating FCS Northern Iowa was already a step forward compared to year one, but the Cyclones also dragged rival Iowa to overtime last weekend before falling 44-41. As of right now, they’re graded as the 24th-best offense in the country, per Bill Connelly’s S&P+ rankings. Running back David Montgomery leads the way on the ground, with 194 yards (5.7 yards per carry) and three touchdowns, while Jacob Park puts in an impressive performance at quarterback so far. The junior has completed 64 percent of his passes for 618 yards and six touchdowns — already on pace to shatter last year’s numbers. Receivers Hakeem Butler and Allen Lazard have also helped out immensely, combining for 26 catches, 334 yards and five touchdowns between them. Numbers like that and efforts like they put forth vs. Iowa on Saturday will only continue to push the new narrative about Iowa State as a competitive, rising program in the Big 12. Recruiting returns are never going to be amazing, but a top-50ish class focused on three-stars (like 2017’s was) is a modest and attainable goal. Campbell has some young talent on this roster right now with players like Butler, who’s a sophomore. But the reinforcements arriving will all be completely geared toward his system on both sides of the ball. Bringing in players that fit and getting the time to turn them into winners is what Campbell was hired to do, and even in just 14 games, you can tell he’s on his way to achieving that. 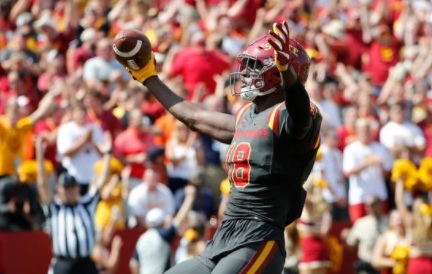 In a conference built on offense, his Cyclones already appear to hold their own. The sustainable culture he’s creating around Midwest football tenets (run game, winning in the trenches) is a real path forward for Iowa State, and he’s going to get the time to build this thing. There is no “golden era” of Cyclones football. And a very difficult Big 12 slate likely prevents a year 2000 redux this season. However, the pieces are coming together around this offense and this program. Perhaps very soon, we’ll be looking at the first true period of real and lasting success for Iowa State.